The CFPCM Certification is attracting the attention of a wide cross section of the student and professional community in India. There have been expressions of interest from professionals as diverse as Chartered Accountants, Masters of Business Administration, Engineers etc. as well as from persons employed with some of the biggest financial service organizations in the country. However, such expressions of interest have not always translated into registrations for the course due to the apprehension that their hectic schedules will not permit them to devote adequate time for academics. 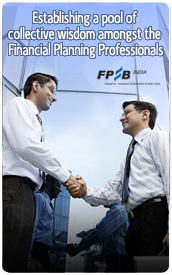 FPSB India recognizes that these professionals already possess certain skill sets and proficiency which is expected of Financial Planners. Hence, in order to enable eligible professionals (both in terms of education as well as experience) to acquire the CFPCM Certification in a more time efficient manner, FPSB India has introduced a fast track Certification Program in line with global certification practices which has been christened as “Challenge Status Program”. 10 Company Secretary from Institute of Company Secretaries of India. 1. Candidates with Post Graduation in Management (other than Finance) qualifications need to have compulsory SEBI/ IRDA mandated Certification as well. 2. Post Graduation qualification implies at least two years’ of full time education in an education institution: Alternatively equivalence as recognized by appropriate statutory authority viz. UGC/AICTE etc. as Post Graduation qualification (deemed) may also be considered. 3. Candidates having cleared the Civil Service Examinations (Mains) conducted by Union Public Service Commission (UPSC) in the prescribed subjects viz. Commerce, Engineering, Economics, Law, Mathematics, Management, Physics and Statistics and having at least 3 years work experience OR candidates having cleared the Services Examinations conducted by Union Public Service Commission (UPSC) and having at least 3 years work experience in Accounts, Finance and related Departments shall also be eligible to appear for the Challenge Status Program. Advanced Wealth Management Course from IIBF: FPSB India has entered into a Memorandum of Understanding with Indian Institute of Banking and Finance (IIBF) allowing the candidates who have successfully cleared IIBF’s Advanced Wealth Management Course to attain CFPCM Certification through the Challenge Status Program. A candidate is required to provide a valid proof of one's adequate experience (3 years or 5 years, as described below) prior to applying for Advanced Financial Planning exam (Exam 5) under Challenge Status Pathway along with proof of having completed a higher qualification than a Graduate, viz. a Post Graduate qualification in select specified streams or a specified professional qualification. In respect of the pre-requirement of adequate experience in the CSP, a candidate may be categorized as working in a Financial Institution or Corporate entity engaged in financial services. Here also the candidate should be engaged in core financial services identified by the abilities under any one of the six components of Financial Planning, viz. Financial Management, Asset Management, Risk Management or Insurance Planning, Tax Planning, Retirement Planning and Estate Planning. Three years' prior experience is considered as adequate for eligibility under CSP for such candidates. A candidate working in a Financial Institution or Corporate entity engaged in financial services may, however, be engaged in 'other financial services'1 not specifically identifiable by the abilities under any one of the six components of Financial Planning. Similarly, a candidate may be working for a Corporate entity not engaged in financial services (viz. it can be a company engaged in manufacturing, services, etc. ), but he/she may be posted in the finance department of the company dealing with one or more of 'other financial services'1. Such candidate shall be required to have five years' prior experience to be considered as adequate for eligibility under CSP. All work experience related documents should be supported by evidence and certificates duly attested by a Gazetted Officer or Notary Public appointed by a State Government or Central Government. The candidates employed with banks, financial institutions and Charter Member organizations of FPSB India can get the documents attested by their Head - HRD. If, at any time prior to or after conferring the certification, it is found that the work experience certificates are not authentic and information provided is false, the Board reserves the right to reject the respective application or cancel the certification and forfeit the certification fees, such forfeiture of fees not being limitation of any other action foreseen by the Board. The Board reserves the right of determining acceptable work experience and may call candidates (at their own expense) for an interview. The decision made thereafter by the Board is final. Candidate having experience in Financial sectors, will have to provide a short job description of the profile been handled which need not be attested. Kindly note that the (Exam 5) Fees of Rs 8,260/-(incl of service tax) has to be paid at the time of exam enrollment on the NSE website. Rs 4500/-, Pay to Financial Planning Standards Board India, payable at Mumbai.